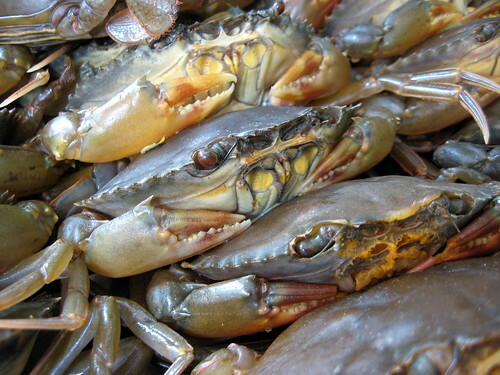 Why: Because I dream about crustaceans smothered in a sweet and tart tamarind sauce every other night. Don’t forget to order a plate of glass noodles with hunks of fresh crab meat (mien xao cua). Tip: If it’s too hot downstairs, ask to be seated upstairs because its got A/C. 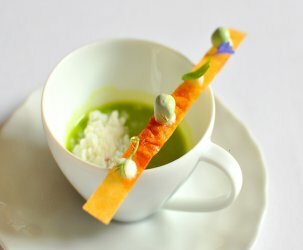 Why: Because they showcase French and Vietnamese fusion cuisine at its finest. Plus they’re quick, easy, cheap and delicious. Where: For the classic cold cut sandwich with pate, mayo, cucumber spears and pickled veggies, head to any of the vendors spread throughout the city (look for the carts plastered with the Laughing Cow logo). 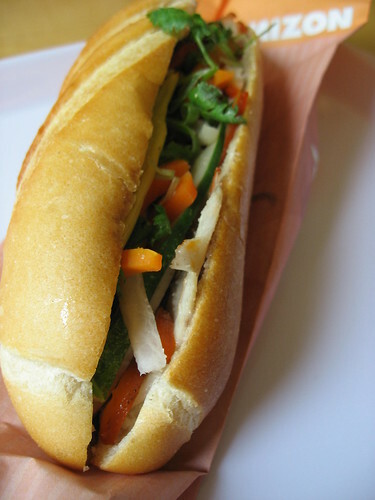 Ask for banh mi thit nguoi. For the freshest bread selection, purchase one in the morning or evening. Why: Because Vietnamese vegetarian fare sticks to familiar flavors and ingredients, and unlike scientifically derived products like Boca Burgers, the fresh vegetables and soy products employed at com chay restaurants are skillfully transformed into wholly satisfying delights. Where: Huong Vien (101 Vuon Chuoi Street, District 3)—the xoi ga chay (sticky rice with “chicken”) is especially stellar and unbelievably similar to the meaty xoi man sold street side. Another winning dish is the banh hoi thit nuong (vermicelli noodle cakes topped with grilled “pork”). 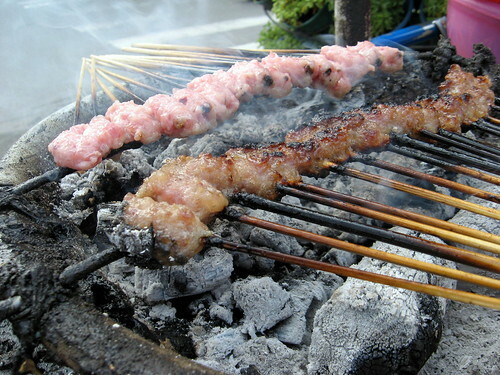 Giac Duc (492 Nguyen Dinh Chieu, District 3)—get the barbecued pork (thit heo quay). Pho Chay Nhu (54 Truong Quyen Street, District 3)—go for the com tam bi cha thit nuong and pho. 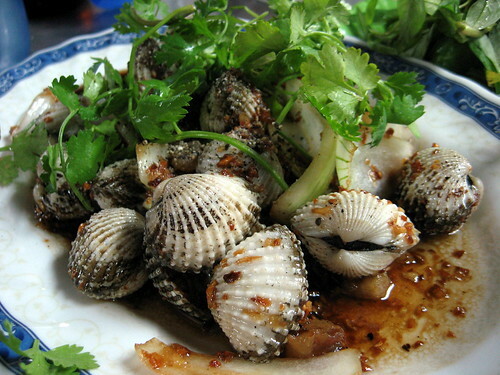 Why: Because it’s a classic dish that every Vietnamese family prepares and eats at home. 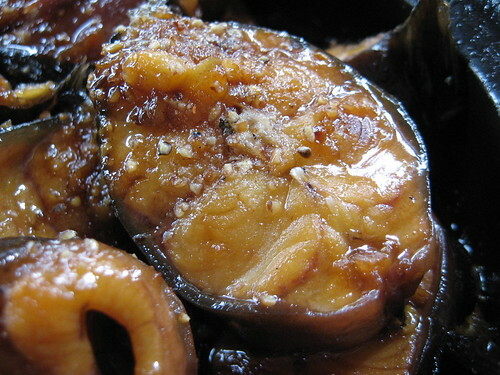 Pick a fatty fish like ca hu, and spoon a generous amount of caramelized sauce atop the fish and rice. The sauce is so killer that I’d be quite content eating it with plain ‘ol white rice. Why: Because it contains pork prepared three beautiful ways. My favorite is the bi—a mixture of pork skin and meat. 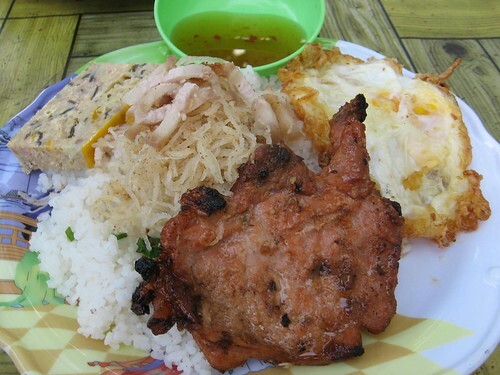 The fried egg (trung opla) on top is a must! Why: Because the blistered wrappers and porky innards are a dynamic duo. Plus, let’s not kid ourselves, everything tastes better deep-fried! 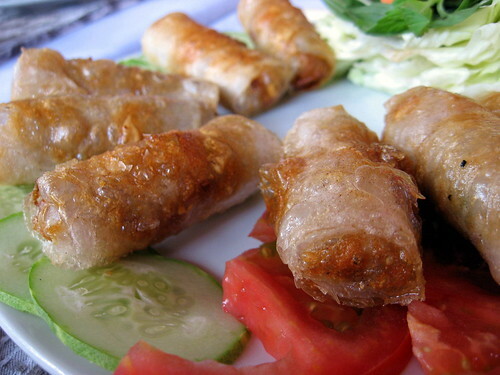 Don’t forget to wrap ’em in herbs and lettuce and dip ’em in nuoc mam. Why: Because the meat’s marinade—fish sauce, sugar and lemongrass—is sensational. Whether paired with cold vermicelli noodles in bun thit nuong or tucked inside a baguette in banh mi thit nuong, Vietnamese-style charcoal grilled pork is tasty business. 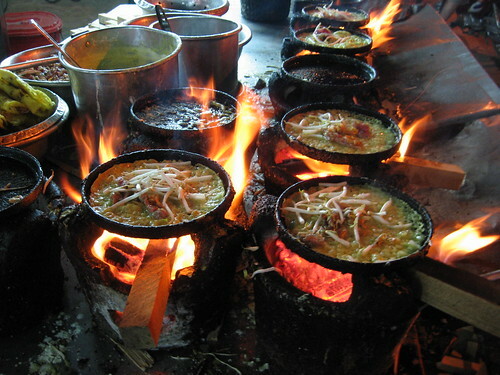 Why: Because che—Vietnamese sweet soups—are a good pick-me-up mid-day when the sun beats down relentlessly. Also, it’s not every day one gets to enjoy a beany dessert! 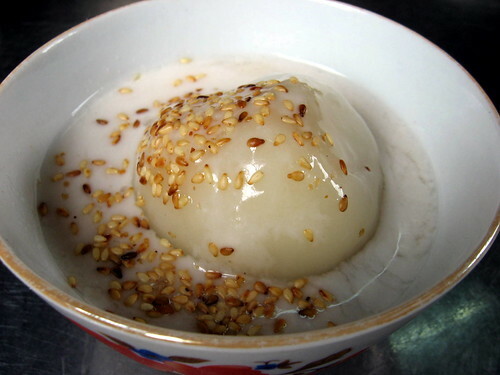 My favorite is che troi nuoc—tapioca orbs filled with mung bean paste and served soaked in coconut milk with a sprinkling of toasted sesame seeds. 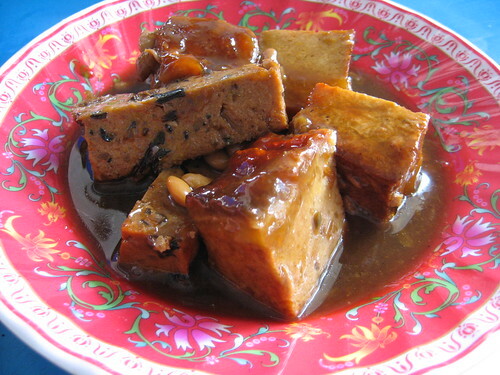 Che thap cam with coconut milk, beans, jellies and crushed ice is another great option. 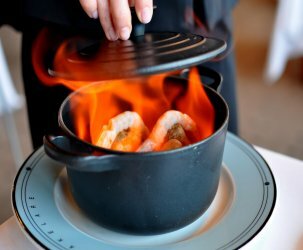 Why: Because fraternizing with locals, taking shots of homemade brew, and eating fresh seafood is a sure-fire formula for a damn good evening. The grilled mussels with scallion oil and peanuts (chem chep nuong) are a must, as are the blood cockles sauteed in tamarind sauce (so huyet ran me). Why: Because bigger doesn’t always mean better. These Central Vietnam-style banh xeo are less than half the size of the southern ones, but are packed with lots more flavor and an addicting crunch. Bo la lot (beef wrapped in betel leaves) makes an ideal accompaniment. Why: Because this off-the-beaten-track neighborhood has incredible energy, delectable street eats and isn’t too far from the city center. 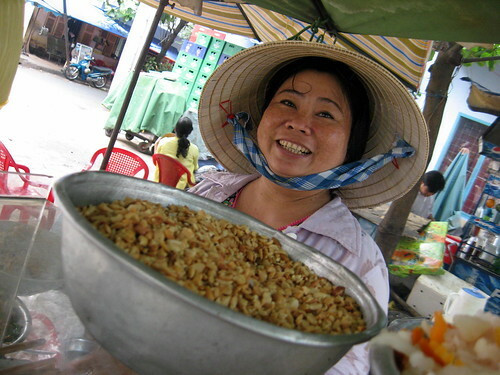 The early morning street food selection is the best around. 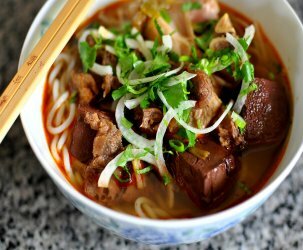 There’s banh uot, xoi, thach, sua dau nanh, bot chien, banh cam, pho, bo kho, banh mi and so much more! Where: Ton That Thuyet Street, District 4. Grab a map (Park Hyatt has nice ones for free), hop a cab, and either speak to the cabbie in Vietnamese or point to Ton That Thuyet street on the map. Get dropped off at the west end on the corner of Nguyen Khoai and Ton That Thuyet. Try to arrive around 7 AM, stroll the entire street and eat until you bust a gut. Why: Because she makes a different noodle dish everyday and has super-magical powers that allow her soup seasonings to simultaneously suit everyone’s tastes. Oh, and her mi ga tiem is one of the city’s best noodle soups. Where: Near 23 Hoang Sa Street, District 1. See map and vendor profile here.